Gary Welsh over at Advance Indiana, has an interesting story about Evan Bayh voting in the May 2011 Indiana primary, claiming Indiana residency, even though he lives in a $3 million Washington D.C. suburban home. The media horns have been out to gore Secretary of State Charlie White over whether he broke Indiana election law by not voting in the correct precinct in his home county where nobody disputes he resided at all times. For that, Democrats are seeking to have him deemed ineligible to hold the office to which he was overwhelmingly elected by Indiana voters last year, and a special prosecutor has been successful in getting a grand jury to bring criminal charges against him. The media should be asking how former Indiana Sen. Evan Bayh could still be casting votes in Marion County if they truly believe White has committed such an egregious offense. 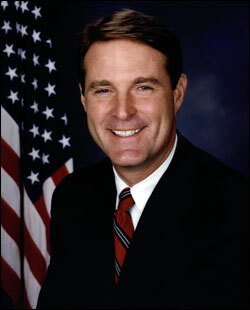 Bayh did not seek re-election to the Senate last year. He now works as a D.C. lawyer, a senior policy adviser for a New York-based private equity firm and a Fox News contributor. He and his wife, Susan, still live in a $3 million home in suburban Washington where they principally resided while he served in the U.S. Senate. Yet Bayh cast an absentee vote in Indiana's May 2011 municipal primary election using a residence for a cheap condo on Indianapolis' northside he claims as a principal residence, even though neighbors have never seen any sign he actually resides in the condo. According to Marion Co. tax records, the condominium located at 1142 Canterbury Square is valued at only $58,200. Because the Bayhs claim the condo as their principal residence and receive a homestead exemption on it, their annual property tax bill this year is only $274.22. To see the rest of the Advance Indiana post, click here. At least with Evan Bayh it is property he actually owns, although he obviously is not a resident of the Indianapolis condo, a fact Welsh documents. 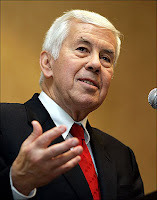 With Senator Richard Lugar, the situation is even worse as I documented in a post earlier this year. He is claiming as his "residence" for voting purposes a house on the northwest side of Indianapolis that he admittedly hasn't owned or lived at for some 30 years. The house has changed hands several times since he moved into the northwest neighborhood in 1960. Sen. Lugar has been signing documents under oath that he resides at 3200 Highwoods Court, which his campaign admits is not true. Sen. Lugar has clearly has committed voter fraud and perjury by doing what he did, yet he continues to get a pass from the media and prosecutors. Why? Because he, like Bayh, is a popular politician. Secretary of State Charlie White is not. Everyone is out to get Charlie White for one alleged incident of voter fraud. Richard Lugar is Charlie White on steroids when it comes to voter fraud. There is no comparison between the two. Now we find out that former Sen. Even Bayh is also flouting the residency requirement, voting using an Indianapolis address where he clearly does not live. If the law is not going to be applied equally to everyone, then it shouldn't be applied to anyone. Voter fraud should not be used for a political prosecution of Charlie White, while ignoring much worse violations by Senator Richard Lugar and former Senator Evan Bayh. Kudos to you and Gary Welsh for keeping the focus on Bayh and Lugar. I used to support Lugar but no more! If you research Lugars background you will find alot of shady characters he counts as friends! In fact if you look into the Esther Schnieder scandal at the Hoosier Lottery you will find Lugar may have had something to do with it. The current head of the state lottery is a woman he campaigned for in a losing bid for a state house seat in 2006. In fact a lot of losers in the Governors admin have ties to Lugar.